It has been a VERY busy, and very FUN week!!!!! No school on Memorial Day Monday to honor those who have lost their lives to fight for freedom, and to honor those who serve our country. We had a lazy day hanging out at our home and eating left over BBQ food from the weekend. Tuesday, Ally had a dentist appointment. I am amazed at how well she did for her first cleaning ever. Last time she just did a flouride treatment. She was a little nervous, so we went slow, but she did GREAT! She stayed in her wheelchair/stroller since it lays flat and has all of her breathing equipment at the bottom if needed. Nurse Lucy and I helped with some of the suctioning and gave Ally a few breaths with her ambu bag when she got a little nervous. She held her breath a little, so we also gave her some deep coughs with her Cough Assist machine, but her lips stayed pink the whole time and she stayed calm. She did not cry (as I believe Melissa and Kristyn did when they were 4). I’m happy to say that she does not have any cavities and we can begin to use flouride toothpaste with her (we suction it out after brushing). Ally does have some teeth that are looser that is a little worrisome, but just something to watch. This might be from the way they grew in, or maybe from one of the times she was intubated. If they get too loose, they told me to bring her in so that she doesn’t lose them and maybe aspirate them. The dentist at Childrens Memorial hospital was EXCELLENT with Ally, and so was his dental assistant. Wednesday was FUN Day for the primary students at Bridge School! Melissa woke up telling me I better get ready and do Ally’s treatment so that she could come. Since it thunderstormed the night before and had a high chance of rain, the location was changed from our park to the school gym. I wasn’t sure if I should still bring Ally since the school is not handicap accessible and is not air conditioned, but Melissa wanted her sister to come, so we made it work. Grandma brought Melissa to school while I did Ally’s morning breathing treatment and our nurse arrived. Lucy finished getting Ally ready and we headed off. The Kindergarten classes were playing on the playground when we arrived. The kiddos were VERY interested in Ally and her computer. Ally did a great job telling them her name, saying hello, and then picked songs for them to sing to her. I made a short video as it melted my heart how kind and accepting children can be. One child with a trach at Melissa’s school said, “She has a vent like me, but it’s in her nose” since Ally was wearing her bi-pap. I gave my muscles, kid talk about SMA and also explained that Ally’s brain IS strong and so is her heart; she loves making friends. I also talked about germs and the kids were soooo responsive. The teachers were also great at letting them hang out with Ally since it was okay with me. 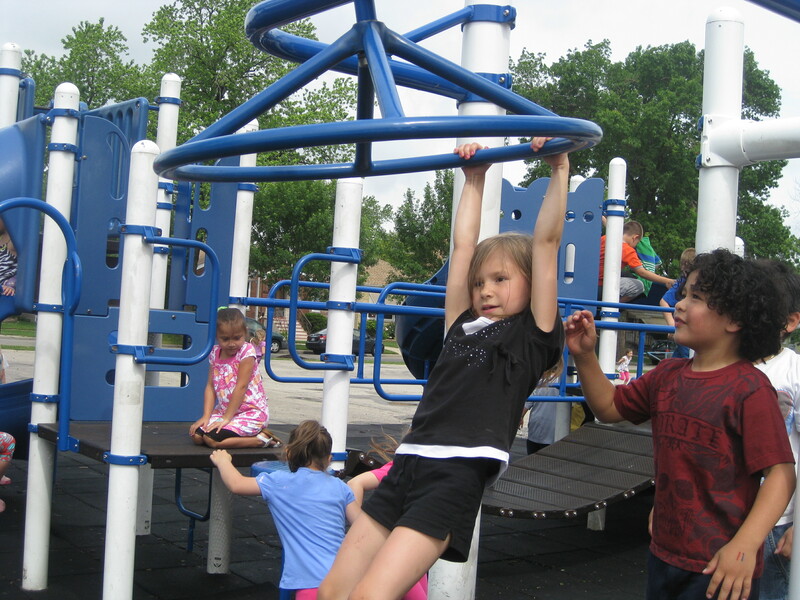 For some of the time, Nurse Lucy hung out with Ally and some kindergarteners and Melissa showed me all the fun things she can do on the playground equipment. She’s my active little monkey. Next, we went in the gym and I helped Ally play a few carnival games. The Bridge PTA did an excellent job and Ally even got to try cotton candy for the first time ever. She seemed to like it, but we only give small tastes and suction afterward. We also want to keep her cavity free. The girls were also made some cool balloons. See all the pics and the short video by clicking on the album at the end of this post. Thursday morning was Melissa’s turn to go to the dentist. Unfortunately she has two small cavities on her back, grown-up teeth. What’s a little crazy is that at some point I signed that it was okay for her to have a dental check at school, and now learned that they charge our state insurance, so her thorough exam at Children’s Memorial might not be covered. They do not tell you this at the school, so I’m pretty upset. I will be talking to them and asking them to better inform parents about this. Melissa will have her cavities filled using nitreous since she is quite nervous at the dentist. I dropped her off at school and picked up Ally to go to her school. Luckily my mom watched her till our nurse arrived and then Lucy got Ally all bathed and ready. I took Ally to school on my own since Lucy was only able to do a few hours to help out. At school, Ally got a new computer mount for her school, high-low learning chair. We also got to enjoy music in her classroom and the weekly all-school music assembly. Friday, we were without a nurse, but I didn’t let it slow us down. I woke up at 5am and began Ally’s breathing treatment at 6:30 am. Melissa and Kristyn were awake at 7 am getting themselves ready. 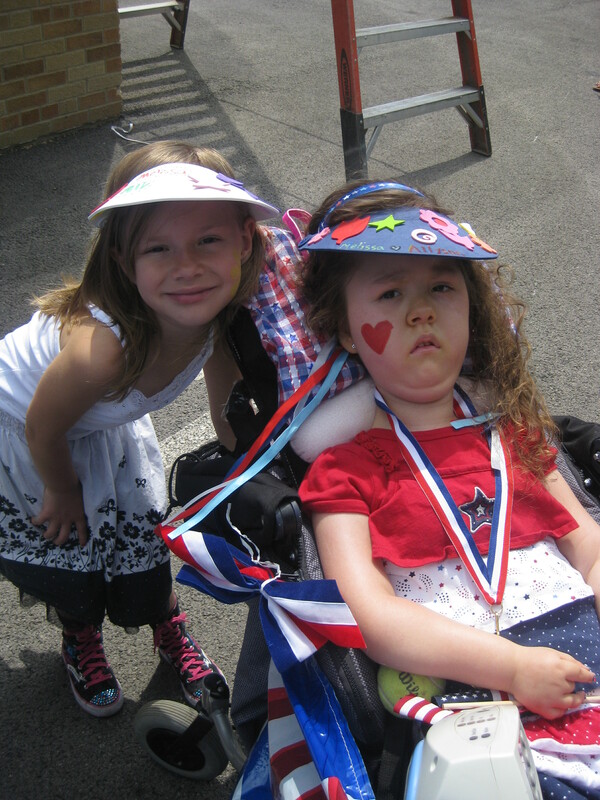 Friday was Family Fun Day at Ally’s school, Stock. Kristyn didn’t come since she had an awards ceremony at her Jr. High, but Melissa did skip school to come. Let me say, Stock’s Family Fun Day was absolutely amazing! It was soooooo well organized and had activities for kids of all abilities. Some highlights were the following: a parade led by Dr. Smith and a band, relay race that Ally did in her wheelchair, police canine unit, face-painting, creating sun visors, BBQ lunch, music with Nelson Gill, playing on the playground, fire department demonstrating their ladder, jumping house….. and just the wonderful community spirit!!!!! I also got to talk to the fire department and paramedic about Ally in case she ever has an emergency at school and they need to call 911. Since I was alone with Melissa and Ally, I am VERY, VERY grateful to the help and kindness of the Stock staff, college students and others. It was sooooo nice to be able to meet some of the other parents/grandparents and also learn more about their children. Melissa ended the day in a SUPER neat, positive way! We went back to Ally’s classroom to get her changed and pack up. There were only two children left at school and one was hanging out on a bean bag and another on a swing. Melissa said about one little girl, “I can understand her and talk to her, like I do with Ally.” She then asked the teachers if she could read a book to the girls and they helped her find Brown Bear, Brown Bear since Melissa knows how to read it using the pictures. The little girls’ faces and eyes lit up when Melissa read to them and Ally. My heart melted, as I am so proud of what a sweet girl I am raising. Times can get crazy in our home, and I’m sometimes afraid how it all might affect Melissa and Kristyn, but yesterday showed me that Melissa will be one amazing woman one day. I can’t wait till next year’s Family Fun Day. Ally will get to be one of the cheerleaders that perform before moving on to Kindergarten. That’s right…Kindergarten is a possibility for Ally. For now, we have two more weeks of school, then Summer School for 6 weeks, and one more year of preschool at Stock. Summer School is actually the best for Ally since there are less germs around and the teachers really have a ton of fun with the kids. It is Monday through Thursday and Ally may get to go alone with her home nurses some of the days. Well, I better get going on Ally’s breathing treatment. Today is Billy’s nephew’s, Connor’s, birthday. Should be fun to hang out with family. 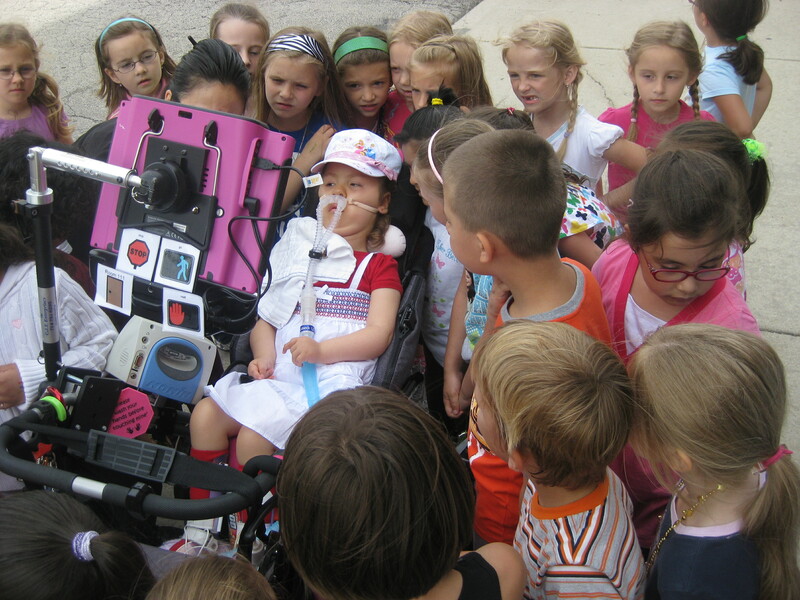 PS — We are up to about 15 people sponsoring Ally for the IL Families of SMA Walk and Roll on June 12th. We have raised over $1000, but my goal is $3000 as we work towards a CURE for SMA. Funding is the only thing really holding this back. FSMA also offers tons of support to families dealing with SMA. PLEASE consider making a donation in honor of Ally. Even $5 makes a difference and can easily be done online at http://www.fsma.org/LWC/httpwwwsmarglly. If anyone still wants to join our team, that is possible too! Thanks soooooo much to friends who have already donated!!!! PSS — I need to acknowledge my very special mother who sewed from 10 pm – 2 am for Ally, and then made some adjustments Friday morning. She made Ally a new red bag and red o2 tank holder for her stroller/wheelchair. 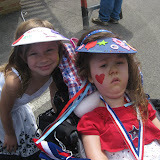 The parade theme was red-white-blue and Ally’s pink and pastel bags, didn’t match very well. Grandma is amazing and worked her booty off so Ally wouldn’t clash. She also stitched Ally’s name on her suction bag, so that it won’t be confused with one of Ally’s friend’s suction bags. My mom is the BEST!!!! One day she will teach me to sew too.